Nice Like Rice and Cosmic Disco have announced the first club night at Theatre Delicatessen’s new space on the Moor. The Kaleido Disco hits TD on Friday February 2nd with rare groove maestro Red Greg and Team Rice on the decks. Theatre Delicatessen was sadly closed earlier this year – after over 2 years of unique events – when it was sold by it’s owners to H&M. But the theatre company quickly opened their new space this September with a string of successful arts events. They are now working with Nice Like Rice and Cosmic Disco on the first dance music event at the new Eyre Street venue. The 2nd of February party sees the return of the popular walk-through Kaleidoscope, as well as a headline set from Red Greg, a veteran disco DJ who rose to fame and credibility after being championed by Floating Points. Support comes from the NLR & CD residents, Team Rice (Risotto, Maiden and Leroy). Cosmic Disco also return to the Harley with their Deep Sea Disco on Wednesday December 13th. 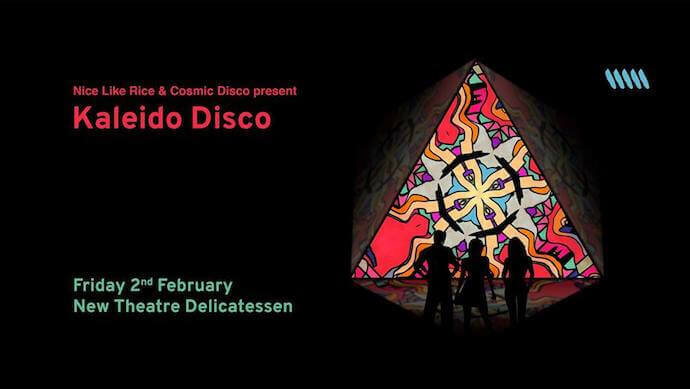 Tickets are available for the Kaleido Disco on Friday February 2nd from £8-£14 here.